Located beneath the majestic span of the Brooklyn Bridge, Brooklyn Bridge Plaza is envisioned as the park’s grand civic space that will finally connect the DUMBO section of the Park north of the Brooklyn Bridge with those to the south on the repurposed piers. Here the shoreline curves dramatically, enhancing views to the East River and Lower Manhattan. 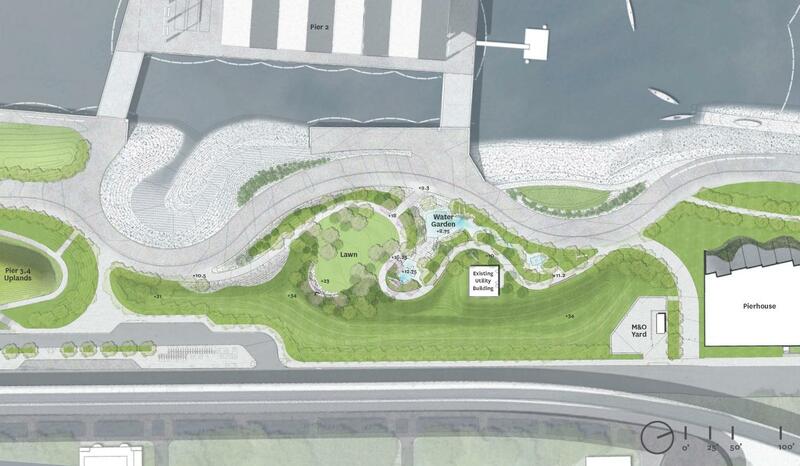 The Plaza will include elements in keeping with the overall Brooklyn Bridge Park design vocabulary. Future programming might include ice skating, seasonal markets, festivals and educational programming. Opening to the public in summer 2020, the Pier 2 Uplands will add 3.4 acres of parkland to BBP. The main feature of this section will be a water garden containing pier remnants cut away from Pier 3 and repurposed to create an exciting water feature with spray jets bouncing water off the pile remnants. Adjacent to the water feature will be a 6,300 square foot lawn featuring a seating area made from salvaged granite from the Brooklyn Bridge Rehabilitation project at the top. This seating area will have a beautiful vantage point looking out onto Pier 1 and the Manhattan skyline. The sound attenuating berm will be continued throughout the Pier 2 Uplands. Construction on Pier 2 Uplands will begin in Fall 2018.